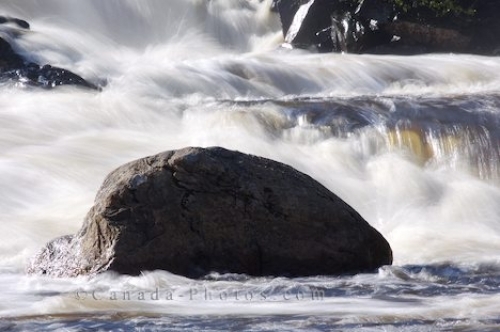 Large rocks protrude from the water that rushes over the waterfall at White Bear River Falls near the Rifflin'Hitch Lodge in Southern Labrador, Canada. When the water is raging at White Bear River Falls near the Rifflin'Hitch Lodge iin Southern Labrador, Canada the waterfall looks spectacular as it cascades over the rock tiers. The large rocks that sit closer to the shore, still seem to be visible as they stand feet above the surface as the white foamy water flows rapidly down the river. White Bear River Falls near Rifflin'Hitch Lodge in Southern Labrador, Labrador, Newfoundland Labrador, Canada. Picture of the waterfall at White Bear River Falls in Southern Labrador, Canada that swirls around the large rocks.